Candlestick construction is relatively straightforward. The thick part of the candlestick is called the body. It illustrates the difference between the open and closing price. Its color and structure (in this case, open red for up and solid black for down) shows whether the market closed up or down during the period (e.g., minute, day, week). The wicks or shadows coming from the bottom and/or top of the body identify the low and high price for the period. Because the body of the candle is thicker than the shadows, candle charts visually stress how the closing price relates to the opening price far more than bar charts. 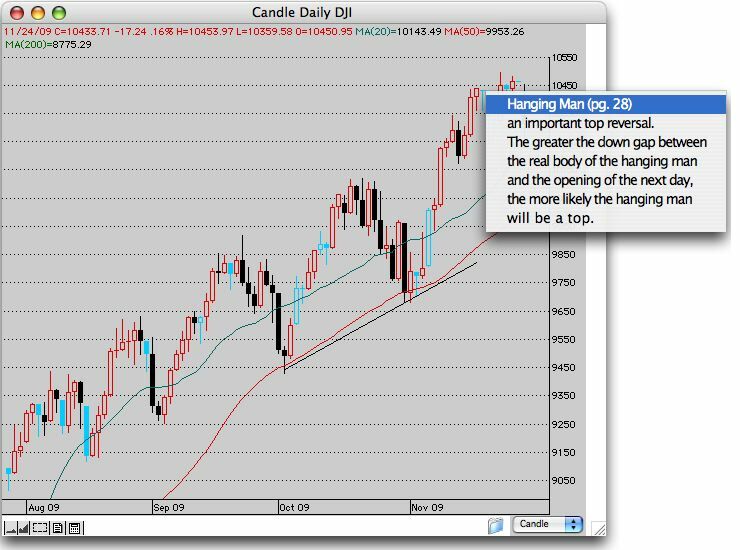 The Japanese look for patterns that are formed by the last two or three candles which indicate continuation or reversal of recent trends. The patterns have names based on translations of their Japanese names. One of our advanced features is identifying these patterns for you. Turn this feature on and candles that identify patterns are "painted" in offsetting colors (cyan in our example). Hold the mouse down on any of these candles to read a description of the pattern and its meaning. Page numbers are a reference to Steve Nison's book on candlestick interpretation. Our products identify 26 key candle patterns and HotlineX alerts you live as patterns form!